A passenger accused of groping a woman on Southwest Airlines flight 5421 reportedly tried to justify his actions to New Mexico authorities on Sunday by stating that US President Donald Trump has said grabbing women is no big deal. The accused man was identified in an affidavit filed in New Mexico's Bernalillo County as 49-year-old Bruce Alexander. 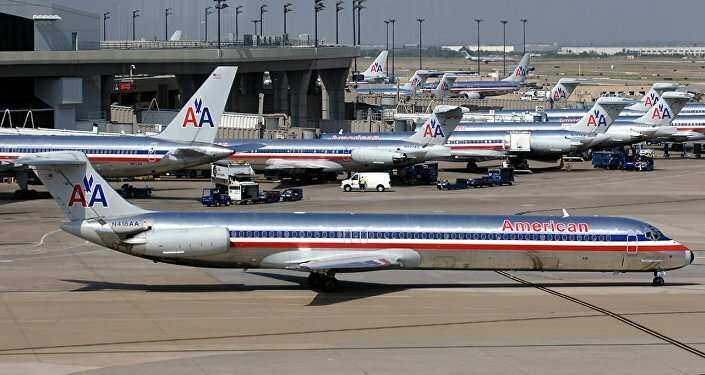 The alleged groping incidents took place moments after the Albuquerque-bound flight began boarding procedures in Houston, Texas, Sunday. According to the affidavit, the woman, identified as C.W., first noted Alexander's forward behavior some 15 to 20 minutes after she had briefly fallen asleep after boarding the flight. She told officials that she felt her clothing being tugged on as she felt fingers making their way along her "bra line" on her right breast. The woman brushed off this first incident as an accident. However, 30 minutes later, she felt fingers grabbing onto the back of her arm. Recalling how a hairy hand with thick fingers and dirty fingernails made its way to her right breast for a second time, C.W. told authorities that her side was being "attentively" groped. Fed up, the woman quickly stood up from her seat and confronted Alexander about his alleged behavior, telling him that he needed to stop and that she couldn't understand why he thought it would be acceptable. After calling a flight attendant, C.W. was seated elsewhere. The affidavit does not mention any further altercations between the two travelers. A passenger identified as G.L., who was initially sitting next to C.W., told law enforcement officials that he was unaware of Alexander's alleged behavior and that he had only observed her outburst. Once the flight landed in the Land of Enchantment, Alexander was cuffed and whisked away by officials. During an interview, he told investigators that he'd slept most of the flight albeit the moment that he was confronted by C.W. Alexander also stated he couldn't remember if he'd ever tried to get his hands on his carry-on baggage, which was stowed underneath C.W. 's seat. The affidavit goes on to note that neither C.W. nor Alexander were under the influence of sleeping aids or alcohol. Both individuals were strangers to one another. Alexander's curious comments didn't come until after he was cuffed and placed inside a police cruiser. Moments after asking FBI agents about the charges and what his sentencing could be, he remarked that "the president of the United States says it's okay to grab women by their private parts." Alexander's defense is a reference to the 2005 "Access Hollywood" tape that contained a conversation between Trump and then-host Billy Bush in which 45 boasted about grabbing women "by the p***y." The offending traveler appeared in federal court on Monday and was charged with abusive sexual contact. A Southwest Airlines spokesperson told Sputnik on Tuesday that the airliner takes the "protection of our customers very seriously." "Our number one priority is always the Safety and Security of our Customers and Employees," the spokesperson added, stressing how flight staff are trained to deal with disturbances on the flight. This incident comes days after another man traveling on a Southwest Airlines was taken into custody for harassing a female passenger. The 29-year-old man faces a felony charge of interference with a flight crew and a misdemeanor simple assault charge.